Over the past few decades many people, living in both city and rural areas, have witnessed an increase in humidity and rising temperatures. It is not a mystery that the Earth is experiencing climatic changes globally. These changes also affect the way we live. Humanity is connected to the Earth and needs its mother planet to survive. Unfortunately, man has become disconnected from his natal environment over the past few decades. While this disconnected attitude may appear to be the theme of modern man’s “maturity”, the fruitage of this course of action has yielded a civilization that can’t solve its own problems. The very same planet that provides life for the human race, hosts a population that lack appreciation for the fruit it yields. However, there are other earths that suffer in all of this and these earths are in the human body. Similar to the planet Earth, the human body is made up of 75 percent water. The human body contains many of the elements found in the Earth’s soil. It is no surprise that the majority of people who are disconnected from their natal Mother Earth are also suffering from poor health. Water is a fundamental part of our lives. It is easy to forget how completely we depend on it. Human survival is dependent on water — water has been ranked by experts as second only to oxygen as essential for life. The average adult body is 55 to 75% water. 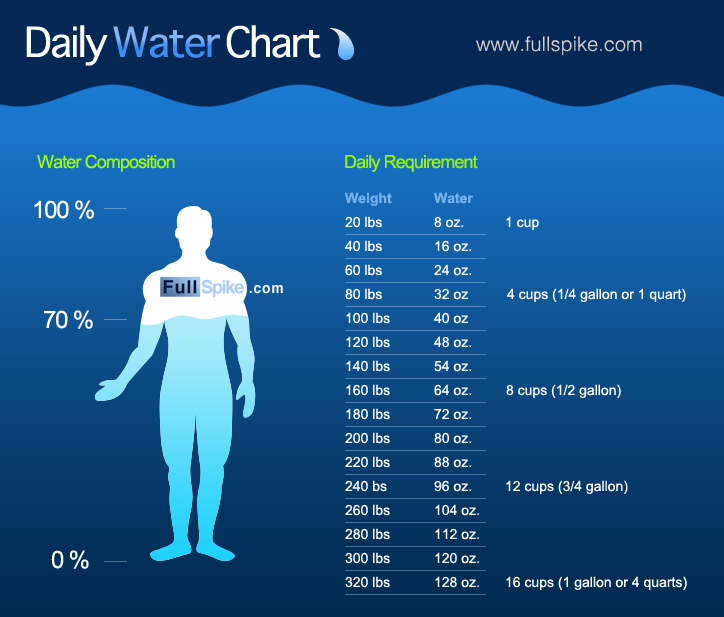 2/3 of your body weight is water (40 to 50 quarts). A human embryo is more than 80% water. A newborn baby is 74% water. Every day your body must replace 2 1/2 quarts of water. The water you drink literally becomes you! Since such a large percentage of our bodies is water, water must obviously figure heavily in how our bodies function. We need lots of fresh water to stay healthy. Water is the medium for various enzymatic & chemical reactions in the body. It moves nutrients, hormones, antibodies, & oxygen through the bloodstream & lymphatic system. The proteins & enzymes of the body function more efficiently in solutions of lower viscosity. Water is the solvent of the body & it regulates all functions, including the activity of everything it dissolves & circulates. Water helps regulate our body temperature through perspiration, which dissipates excess heat & cools our bodies. We even need water to breathe! As we take in oxygen & excrete CO2, our lungs must be moistened by water. We lose about 1 to 2 pints of water each day just exhaling. Asthma is frequently relieved when water intake is increased. Histamine plays a key role in regulating the way the body uses & distributes water & helps control the body’ s defense mechanisms. In asthmatics, histamine level increases with dehydration. Our defense for the body is to close down the airways. The kidneys remove wastes such as uric acid, urea & lactic acid, all of which must be dissolved in water. When there isn’t sufficient water, those wastes are not effectively removed, which may result in damage to the kidneys. Water lubricates our joints. The cartilage tissues found at the ends of long bones & between the vertebrae of the spine hold a lot of water, which serves as a lubricant during the movement of the joint. When the cartilage is well hydrated, the two opposing surfaces glide freely, & friction damage is minimal. If the cartilage is dehydrated, the rate of “abrasive” damage is increased, resulting in joint deterioration & increased pain. The actively growing blood cells in the bone marrow take priority over the cartilage for the available water that goes through the bone structure. Rheumatoid joint pain frequently decreases with increased water intake & flexing exercises to bring more circulation to the joints. 75% of the upper body weight is supported by the water volume that is stored in the spinal disc core. 25% is supported by the fibrous materials around the disc. The spinal joints are dependent on different hydraulic properties of water which is stored in the disc core. Back pain is frequently alleviated with hydration. Brain tissue is 85% water. Although the brain is only 1/50th of the body weight, it uses 1/20th of the blood supply. With dehydration, the level of energy generation in the brain is decreased. Depression & chronic fatigue syndrome are frequent results of dehydration. Migraine headaches may be an indicator of critical body temperature regulation at times of “heat stress.” Dehydration plays a major role in bringing on migraines. Dehydration causes stress & stress causes further dehydration. What are you going to do when you find out that its not the Illuminati, but lack of self-responsibility that’s coming for you? Stay replenished!